When it comes to packs, I have a better understanding of why some women own so many purses...it's just impossible to find one that covers all activities and uses. Bottom line, I have a lot of packs and each one covers a specific range of activities. From a simple 30L day pack, to a 45+L climbing/bushwhacking pack, 65L 3 day overnight pack, 70L Mountaineering specific pack, to a 85L Expedition/Winter pack. Of those packs, no other backpack in my arsenal has seen more action than my Dueter Guide 45+. To sum it up in one word, this pack is TOUGH! The Deuter Guide is designed as an alpine climbing pack so its profile is slim which makes it ideal for bushwhacking. If my shoulders, the widest point of my body, can pass through so can this pack. There are no external pockets which means anything I put in this pack stays in this pack. The absence of exterior pockets also means less material to snag on branches, thorns, etc. It can be accessed from the top, the side, or the bottom and the single lid compartment has enough room to fit items such as headlamps, snacks, and other small items. As a climbing pack, the 8 gear loops serve as attachments points for carabiners and hanging wet shoes or anything else for that matter. Built in webbing under the lid allows me to attach my climbing helmet and up to 200ft of coiled climbing rope. Last of all, the 45+ means this pack will expand another 10 Liters upward to make room for additional gear. The lid gets raised up and the pack now has a 55L capacity! 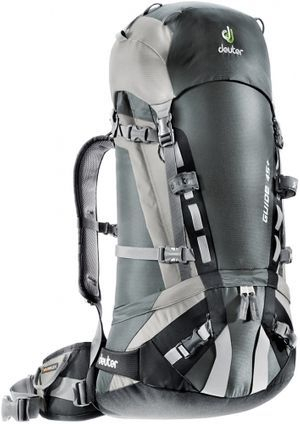 The Deuter Guide weighs in at 3 pounds 15 ounces and can be adjusted to fit any torso size. 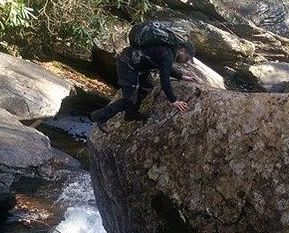 It is most comfortable supporting loads up to 35lbs but can haul loads exceeding 40 pounds. The material used in this pack is Duratex 330D Micro Rip Pro which is both tough as well as extremely tear and abrasion resistant. Volume: The volume or capacity of a backpack is always measured and expressed in Liters. Typically, you will see a particular model of a backpack followed by numbers. For example, an Arc'Teryx Ultra 65 or Deuter Guide 45+. The Arc'Teryx is a 65 Liter pack and the Deuter is a 45+ Liter pack. Common pack sizes and uses. SIZING: This is the most important part of selecting a comfortable pack. Remember this, backpacks are not clothing. Just because you wear a Large or Extra Large shirt does NOT mean you need a large or extra large backpack!!! Example: A lean man with a 32in waist may wear medium pants and a medium T-shirt. That same man with a 40in waist would wear large pants and an extra large T-shirt. The mass of that person changed but he would wear the same size pack in both cases. Why? Because backpacks are sized to fit particular torso lengths. The size of a backpack is determined by measuring the distance between your C7 Vertebra and the Iliac Crest. The iliac crest is the top or "shelf" of your hipbones. The diagram above illustrates how to measure your torso length. The distance between point A and point B is your torso length generally expressed in inches (in). Know your torso length when selecting the size of a backpack so you get the right fit! I know my torso length is 17" so I wear a small backpack. Ironically, a backpack is the only thing I wear in a size small!!! Below is a general torso length to backpack size formula. Extra Small: Fits torsos up to 15 ½"
Small: Fits torsos 16" to 17½"
Medium/Regular: Fits torsos 18" to 19½"
ADJUSTING: Once your have the correct sized backpack, the next step is adjusting the pack. Adjusting a pack can be broken down into a 4 step process. Step 1: HIPBELT Position the Hipbelt so that it wraps around your iliac crest and tighten the hip belt. The buckle should come across your belly button. An inch above or below your belly button is also okay. This step is crucial because your hips will carry a majority of the packs weight. Step 2: SHOULDER STRAPS Adjust the shoulder straps by pulling down and back slowly on the straps on each side simultaneously. 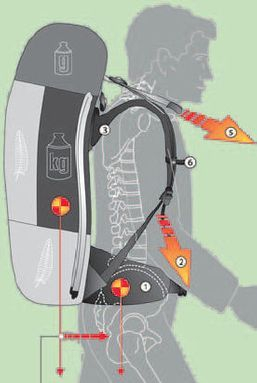 Shoulder straps are labeled 2 in the arrow on the diagram. The purpose of the shoulder straps is to keep the pack flush against your back NOT to carry the load. It's the job of the hip belt to carry the brunt of the load. Step 3: LOAD LIFTERS The load lifter straps are located near the tops of your shoulders. In the diagram they are labeled 5 in the arrow. The job of the load lifters is to pull the packs center of gravity closer to your body. Adjust by gently pulling the straps forward. If done correctly, the angle of the straps should form a 45 degree angle. Use caution not to over tighten these straps! Step 4: STERNUM STRAP This strap goes across the upper middle of your chest between the two shoulder straps. The purpose of this strap is to keep the shoulder straps from moving back or across your shoulders. This is NOT a weigh supporting strap so no need to crank it! The sternum strap is labeled 6 on the diagram.